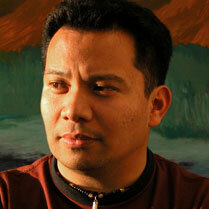 Roel Banzon Robles was born in Manila, Philippines, on September 16, 1971. His family immigrated to California in 1975, shortly before he turned four years old. While growing up in the US, Roel soon discovered monster and martial arts shows such as Creature Feature and Kung Fu Theater, and had shown much affinity and keen interest in them. Eventually, Roel would end up drawing pictures of Frankenstein, Dracula and the Wolfman, and would spend endless afternoons pretending to be a Ninja. His father’s introduction of comic books to him became an early influence in his love of art as he began to constantly draw, and emulate the works of notable artists, such as John Buscema and Frank Frazetta. Ray Harryhausen’s movies were another major factor in Roel’s desire to be involved in film design. When Star Wars was released in 1977, his interest grew even further and he knew instantly that he wanted to work in the film industry. He studied for three years at San Francisco State University and, then, took his first film job in 1997 working at Lucasfilm on Star Wars Episode 1 The Phantom Menace, as well as Star Wars Episode II Attack of the Clones, with Design Director Doug Chiang. Under Doug's guidance and tutelage, he worked with the Art department where he developed the skills needed for the motion picture industry. After Star Wars Episode II: Attack of the Clones, Roel decided to work as Concept Designer and Storyboard artist for Xulu Entertainment, a videogame company based in San Francisco. The experience Roel has gained working for this company further enhanced his artistic skills. In 2002, Roel, once again, worked with Doug Chiang and his new team on Warner Brother's instant Christmas classic, The Polar Express. He then continued to freelance as a Concept and Storyboard artist on various films, such as Twisted, Assassination of Richard Nixon, and The Fire and the Sword. Roel also storyboarded and choreographed the martial art sequence for Doug Chiang’s teaser film Robota: the Hunted. Other notable projects included developmental bids on TV shows, web sites and role-playing games. He also has been a speaker at Oracles “Thinkquest Live”- a global, young adult web design competition in 2004 and 2005. He is currently working at Iceblink Studios in San Rafael on Robert Zemeckis's upcoming CG movie Beowulf.